The property is a large luxury villa with it's own private pool 8 by 4 mts. It was built to personal specification in 2005. It comprises of 4 double bedrooms, 2 bathrooms, open plan lounge/diner through archway to the kitchen. At the rear is also a utility room. The property also has a garage for storage. At the rear of the villa is a built in BBQ and ample room for loungers around the pool. There are 2 large terraces accessed from the first floor landing and a front terrace on the ground floor. It is ideally located within walking distance of the beaches of Lo Pagan or the town centre of San Pedro del Pinatar where all amenities can be found. Smoking only allowed outside the property. Everything you could need for a good holiday is in this clean, spacious villa. Close to the nature area and a short stroll to the mud baths at Lo Pagan. We hired bikes and enjoyed the safe, level, cycle routes. We were met by a lovely English speaking lady, who gave us a full tour of the villa. I would certainly recommend this holiday home and hopefully, will be back one day. Thank you John for your very appreciative comments on your family stay at the house. You covered everything about the area and the accommodation. It was good to have such an informal liaison with you and hope you might try another trip shortly. Best regards to you and family. 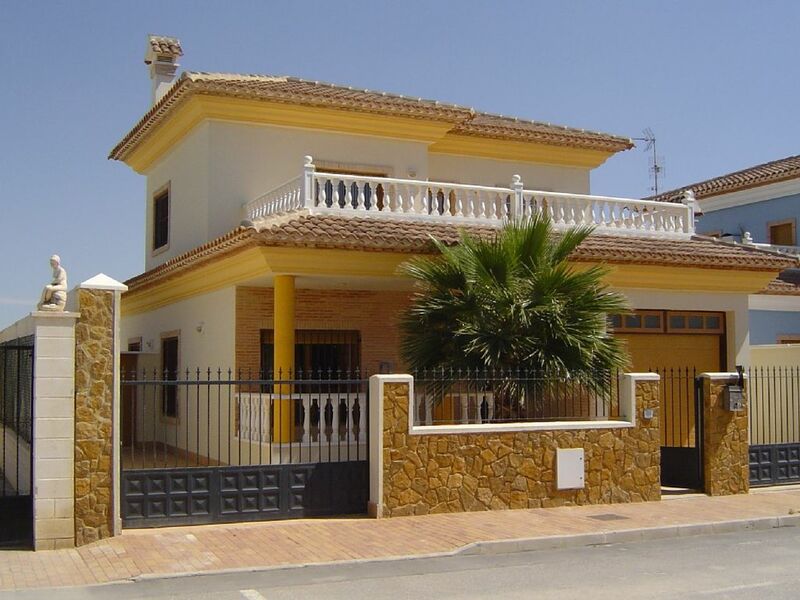 My family and I have just returned from Murcia and this fabulous villa. I would recommend this part of Spain to anyone with a family. There is enough to do during the day and at night. The local restaurants are well priced as are the markets. A real find. The villa is better than described, it is a true home from home, you couldn't ask for anything more. Booking the villa was so easy and my dealings with Jean were very helpful, it was a pleasure. We did not book any transfers as there were local taxi's at the airport. It cost 22 euro, one way. Once at the villa we did not need a car; as all the amenities are easily reached on foot. Thanks for the great review! As you say it is a fab area and all within walking distance. A good mix of typical Spanish with just enough English thrown in!!!! The living and dining areas are spacious and airy. The pool area is lovely, with different seating areas, plenty of shade and sun loungers. With the 1st floor terraces to the front and back of the house and the verandah on the front - you can always find a quiet space away from the pool to enjoy a good book. The upstairs bedrooms both had memory foam mattresses which were very comfortable. Lots of spare bedding was available for all beds - there were plenty of beach and bath towels too. In the garage were 3 bikes, chairs for the beach, inflatables for the pool - even a travel cot. There is a bakery and cafe bar just minutes away. We didn't hire a car, so found it easier to walk to the supermarket - 10 mins to Maxi Dia and a further 5-10 mins to Mercadona (which is much bigger, but we thought more expensive) and get a taxi back (costing 3-5 euros). The centre of San Pedro, where there are bars/restaurants, is about a 15-25 min walk away- we had an age range of 6-71 - so it took us a good 25 mins. We ate at both Que Cruz and Capri - which were both very nice and reasonably priced. The Lodosol apartment complex, two blocks away, had lovely breakfasts for 3 euros which we had a couple of times and also had a bar with evening entertainment and meals - although we didn't go there on an evening. All in all we had a fantastic holiday, in a gorgeous home from home villa that had everything you could possibly need. The villa was clean and spacious and I'd certainly highly recommend to all and would have no hesitation in returning. Thank you very much for allowing us the use of your home for our holiday. I took my sisters and a niece here for a family holiday. I particularly wanted somewhere where I wouldn't have to drive and this lovely villa suited perfectly as you could get everywhere on foot and by bike. The villa and pool were beautifully clean and was probably the best equipped villa I had ever stayed in, we were forever finding another kitchen gadget ! We loved Lo Pagan and the beautiful promenades and bike paths that led out between the Mar Menor and the Med. I hired a bike from the Town Hall but also used one from the villa. Linda, the lady that looks after the villa was lovely and very helpful. Loved everything about the holiday and will return. It was nice to have such a positive response from someone in the same situation as myself. I am really pleased that they all enjoyed their holiday and got to appreciate the area in its natural state. We have just returned from our second holiday to this wonderfull villa. We enjoy the area so much because there is so much to see and do without having to travel any distance and to stay in such a great home with all of the comforts you could want makes a fantastic holiday. We were there during a motorbike exhibition and concert, then the following week end an air show. Also the short distance from the airport is a bonus! Jean has provided bicycles which we used nearly every day to cycle along the beach and then went back to have a cooling dip in the pool. The shops are in walking distance so we were able to get fresh BBQ food daily to eat al fresco on the private patio area and there are some excellent restaurants close by, the menu del dias at Los Molinos is the best in our opinion! What can I say? Fantastic villa, absolutely perfect in every way, a true home from home, everything provided you could possibly need, including 2 bikes which my son and I used on numerous occasions to recce the local area looking for bars, restaurants, shops and beaches. The Villa was spotless on arrival and a the welcome pack we asked for waiting for us, very usefull on a lat night flight in. The Villa is well placed, being in a quiet residential area, but within 2 mins walk of a lovely panadaria/cafe bar, 2 mins more to another bar, and approx 15 mins walk to both the centre of San Pedro and the prom of Lo pagan. The resort is very very Spanish, (thankfully), and although most will speak english, a little spanish is appreciated, and we found all to be very friendly and helpful. Some nice bars and restaurants nearby, Casa Miguel on the front at Lo Pagan serve beautiful Tapas, Jose Antonio's heladaria (ice cream shop) is a great place to sit with an ice cream, (or a beer) and watch the world go by. We found a lovely beach just through El Mojon, plenty of parking behind the beach, walk through the dunes, beautiful soft white sand. Try Cartagena, beautiful port with big yachts, beautiful bulidings, nice shopping and eating, lots of history. The square in San Pedro is well worth the 15 min walk, very spanish, a few bar/restaurants serving very nice food, with a great atmosphere. The front at Lo Pagan, again another 15 min walk is a lovely wide prom right along the sea front, lined with bars and restaraunts , plus the soft golden sands of the Mar menor, and the very safe swimming on the other side. The Villa is fantastic, no other word describes it better, 4 large double bedrooms all with air con, the two downstairs straight onto the large patio and swimming pool, which is a large one in comparison with some. allowing for all 4 of our group to enjoy it at the same time, ( i hope who follow us in appreciate the various lilos we left as much as we did). The bulit in BBQ was used twice, and again is excellent, the design making it very easy to use, although if it gets dark it is hard to see what you are cooking! The patio is large, much larger than it looks in the picture, so plenty of room to lay out on the loungers as well as taking in the shade on the TWO outside dining tables. The upstairs terraces are also very large and we used the front ones on many occasions (just had to take up the chairs from the garage). Will DEFFO be going back!!!! Well, what can I say! I couldn't have written better myself but again it's just good to know that Matt and his family enjoyed their holiday and got to know the area so well as it really does have a lot to offer for all tastes. Lo Pagan is the resort area of the town of San Pedro del Pinatar which in the summer months is a busy seaside resort but as the tourist season dies down the town is still busy with locals. It is an ideal location as it is on the shores of the Mar Menor and easily accessible to the Mediterranean Sea. The area between has been designated a Nature Reserve and therefore benefits from a large conservation area around the salt flats where many species of birds can be found including flamingos. This area of Murcia has recently grown into a golfers paradise with numerous 18 hole golf courses within easy reach. There are 2 major cities in the area - Cartagena and Murcia itself both can be reached by public transport or by the excellent motorway which serves both cities.